Our interest was sparked by a recent post on Wogblog about a new series of books (still in preparation – Part 1 is being readied for publication in 2015) called A is for Apple. This looks to become the first comprehensive study of Apple Corps, the company which the Beatles set up to handle not only their own recorded releases, films, publishing and the like, but also to build a stable of new and established artists, a fashion label and retail outlet, an electronics division, a music publishing company, and a film production company. A is for Apple is the brainchild of two authors: German Axel Korinth, and Dutchman Ed Dieckmann who have issued a general call-out for more information about all aspects of Apple and its operations, especially photographs, documents, memorabilia, etc. If you have any items of interest you can contact them at: research@aisforapplebook.com, or via their website, where you can also pre-order the book, view some early sample pages, etc. Specifically, Axel and Ed need help with good quality images for a couple of records. A is for Apple won’t be a straight discography but rather a cross between a discography and a narrative. Ed Dieckmann has already compiled a fascinating Apple Records discography on the excellent www.applerecords.nl, but a book like this goes well beyond releases just on the Apple label. This is because Apple Music and Apple Publishing were the rights holders to a wide range of songs, published by all sorts of artists on all sorts of labels. 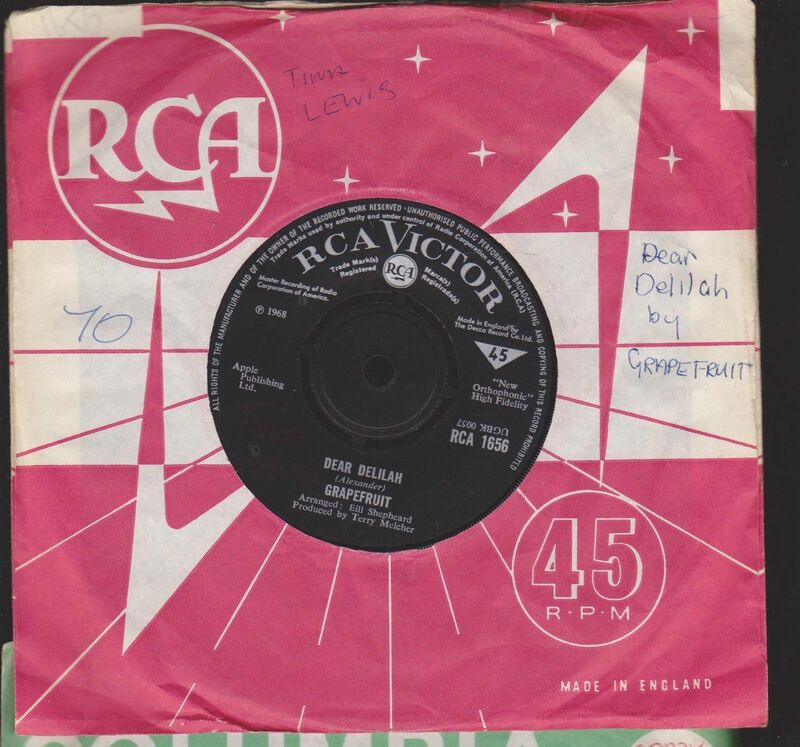 Here’s a typical example – it’s a song from 1968 called “Dear Delilah” by a London-based band called Grapefruit. They were on the RCA-Victor label, but as you can see (on the left side of the label below) their song was administered by Apple Publishing Ltd – a company owned by the Beatles. This is the British pressing (click the image to enlarge): Below is a list of records that the authors of A is for Apple are urgently seeking out to include in their first volume. Of every record mentioned the authors have at least one image, but it’s their aim to show all aspects of a certain record release. In other words they need scans of both sides of labels, the back and front cover and – if available – of any inserts (like those found in Japanese records, for example). If you can help in any way, please do! Paul McCartney: The Family Way (Decca SKLA-4847) – the original 1967 release, not the reissue! Paul Revere & The Raiders: Goin’ To Memphis (CBS S 63265) Stereo pressing only! Ultimately A is for Apple will consist of four volumes in all. It is a huge undertaking. The first instalment (covering the years 1966-1968) is due for publication in the first half of 2015. Each volume of the fully illustrated book will be limited to 500 copies. This entry was posted in Apple Records, Beatles, Beatles Books, Beatles Music, Beatles Related and tagged A is for Apple, Apple Records, Apple Reissues, Beatles, Beatles Books, Beatles Collecting, Beatles Related, Music by beatlesblogger. Bookmark the permalink. I don’t think the Byrds ever had anything to do with Apple. It’s probable that Italian single had Apple in the small print, but it’s probably an error – although maybe I’m wrong on that. They’ve got time to get it proofed, so let’s hope they do. Since Apple has a really big history in such a rather small amout of time this book could very well be the definitive book on the subject if people will come forward and help the authors. From Baker Street, Savile Row, St. James Street to Stratton St. and Ovington Square, Apple Corps has an iteresting tale to tell. There was and APPLE/Beatles Official Fan Club at 1700 Broadway in NYC and a small office at Capitol Records in Los Angles as well. The Apple Offices in Los Angeles were at 18=980 N. Vine street. Hollywood, California 90028 ( according to a pay cheque). Thats 1980 N. Vine Street. Hi – As one of the writers of this book, allow me to react to some of the remarks posted here: The Byrds have no connection to Apple, that is so. We do need scans of this single, however, as it is connected to the Candy movie (starring Ringo). As for the typos/grammar, we will have the final product proofread by an English gentleman with a degree in English, so it should be free of grammatical errors by the time it’s off to the printers. Thanks for your interest! Do you still need a scan? Which Byrds 45 are you looking for? Hi Harold / “Ziggy” – The Byrds single we were looking for was the Italian ‘Child Of The Universe’ single, but in the meantime a kind gentleman from Italy has supplied it……. Great news, Ed. I look forward to it. I have always been extreemly interested in all the the goings on with the Beatles company Apple since I first saw it mentioned as “The Apple” on the “Sgt. Peppers Lonely Hearts Club Band” cover. This project is one that gets my heart pumping. I spent some time at Apple (3 Savile Row) and a lot of time at Apple at 54 St. James Street (1973-75). The comings and goings of Paul (& Linda), George (and Pattie) and Ringo Starr were many. I asually walked up the street with Paul & Linda to the offices, I was handed an Om patch from George personally there and met I up with Ringo and his mate Marc Bolan (T-Rex) there. Fifty Four St. James Street wasn’t very well known, or it didn’t have the “traffic” that 3 Saville Row had. The Apple Scruffs and a the few fans who knew about it made it a easy place to meet the (ex) Beatles. My memories from there are rich and sublime.